India’s best-selling compact sedan is back in an all-new avatar. 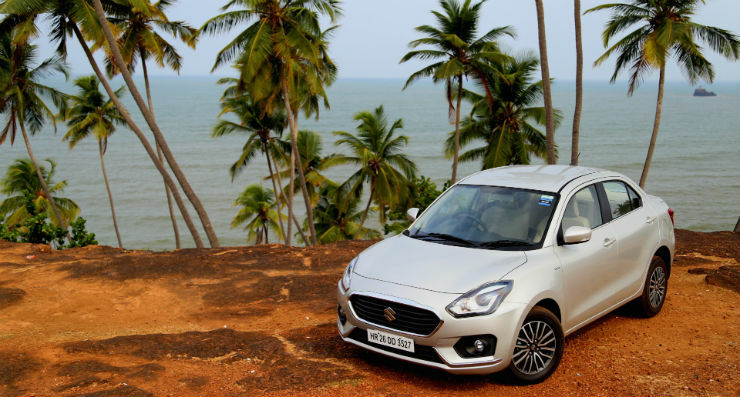 Now that the new 2017 Maruti DZire has been launched, we bring you the first drive impressions, straight from Goa where we had an opportunity to put the new car through the paces. The all-new Heartect platform that underpins the DZire has completely changed the dynamics of the vehicle. The new platform has made the DZire much more comfortable and has improved the handling too. The new platform also makes the car sit lower, so the driver also sits a bit closer to the ground. That gives the driver a better feel of the road – something that was missing from the older generation of the car. According to Maruti, the new DZire uses the same suspension but with a few minor tweaks. With the new settings, the car has become extremely stable. The vehicle now takes on the bad surfaces without any noise – comfort has become optimum. Body roll has also reduced, but it is still not a car meant to take the sharp corners at high speed. Overall, the driving dynamics has improved by a large margin. Maruti offers four combinations of the engines and transmissions. There is petrol-manual and AMT, and diesel-manual and AMT. While the engines’ power and torque outputs remain the same, the car has become a lot lighter – up to 105 kg in base diesel and up to 85 kg in the base petrol. Due to time constraints, we drove only the diesel manual and diesel AMT versions. Both the diesel options offer better NVH (Noise, Vibration and Harshness) levels than the last generation Dzire. While diesel clatter is still present at lower rpms, it smoothens out significantly at higher rpm levels, making for a smooth experience. Maruti still uses the 1.3-litre DDiS engine that used to power the last generation model. Output of the engine has not changed but again, there are a few minor tweaks to the transmission to suit the revised weight. The car now accelerates faster than the older model. The gear lever slots very well and the shifts are quite smooth, unlike the older model that felt slightly notchy. The clutch also has become extremely light in comparison to the diesel cars in the segment. Getting stuck in the traffic would not put much effort on the left leg with the new DZire. The Automated Manual Transmission DZire diesel variant was also present in the older generation model. The new one behaves quite similar to the last model. The signature characteristics of AMT is still there. AMT does take some getting used to but once you get used to the two-pedal manual transmission, life becomes much easier. The crawl mode in the AMT is very useful in heavy traffic. In this mode, the car can do up to 15 km/h without any accelerator input. The AMT also gets a manual mode where greater control over the car can be achieved by changing the gears manually. In manual mode, the transmission does give you a delayed feedback but it is a very small sacrifice to make for the comfort of an affordable automatic. With the lighter weight and lower NVH, the DZire AMT feels much better to drive now. The diesel engine, however, remains low on power below 2,000 rpm mark. Once the turbo blows life into the engine at around 1,800 rpm, the DZire becomes quite the runner. While climbing steep inclines, constant downshifts are needed to make sure that the car gets enough power to tackle the incline. Apart from that, the torque curve is flat enough to make for a steady surge of acceleration through the gears. Certainly! The new DZire has changed by leaps and bounds – it looks like a whole new exciting looking car now. Keeping the car’s DNA alive while presenting an all-new vehicle – that too with a limit of 4-metres was a challenge – and Maruti certainly has done an excellent job. The hatchback with boot design is completely gone and the car has been designed from the ground up. To start with the roofline has come down by 40 mm that translates into more raked A-Pillar and C-Pillar, giving the vehicle a proper sedan outline. The roofline now flows into the boot, giving the vehicle a more proportionate look. There is not much going on the side of the body except for the 15-inch precision cut alloy wheels (available only on the top-spec variants). Lower variant cars come with wheel covers and slimmer 165 mm cross section tyres. The shoulder line stays subtle. The all-new DZire looks brand new from the front. The face has actually become younger. There are almond-shaped headlamps that get LED projector lamps (in the top-end), a first in the segment. The headlamps highlight the trapezoidal grille that gets a thick chrome outline but the grille itself is black in colour. The bumper has been redesigned aggressively too and it gets chrome inserts below the fog lamps. 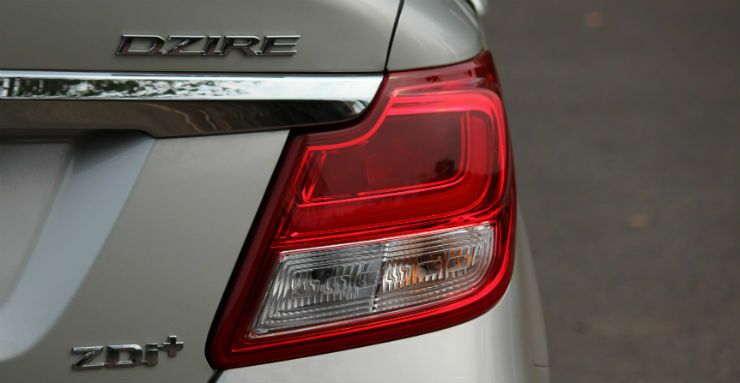 At the rear, the new DZire gets an integrated spoiler on the boot lid which is quite similar to the the Ciaz. The tail lamps have been completely redesigned and get an array of LED that form the brake lamp and an L-shaped stop lamp. The new DZire did turn quite a few heads on the road thanks to its bright LED DRLs. The interiors have been revamped completely. The car now gets wooden inserts on the dual-tone dashboard that makes it look quite premium. 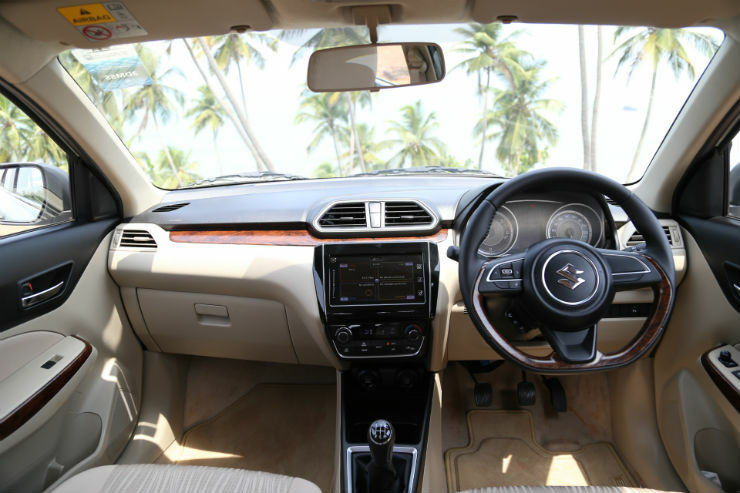 Even the steering wheel gets wooden accent and a flat bottom that adds to the overall premium look. The steering wheel also gets soft touch material on the rim unlike hard plastic used in the last generation of the car. 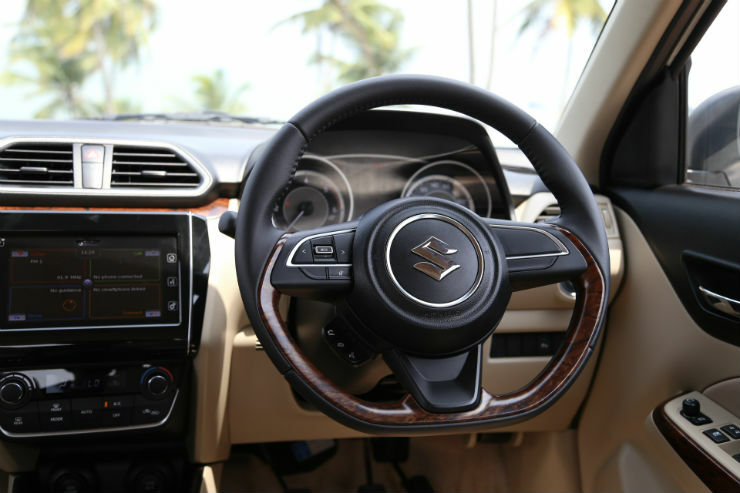 The grip and the comfort on the new steering are way better than the last generation DZire. It also comes with mounted controls to operate the infotainment system. Another major update is the SmartPlay infotainment system that supports Android Auto, Apple CarPlay and MirrorLink. The system has its own navigation system in case you do not want to plug in a smartphone. 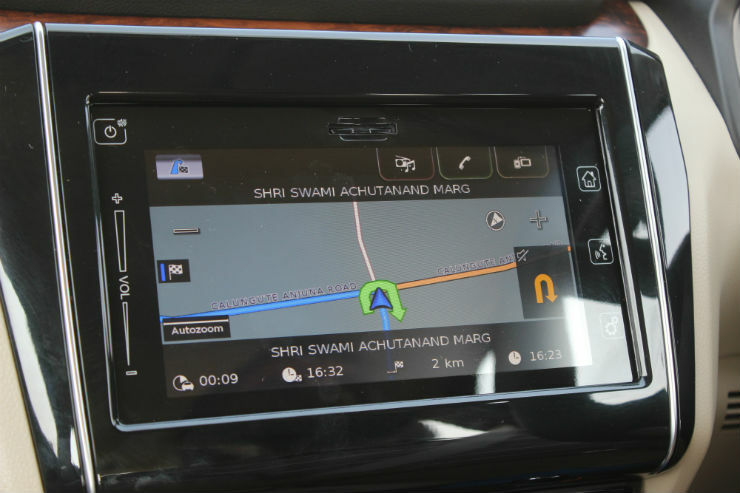 The native navigation application, however, seems to be bit confused and directs the vehicle to narrow roads instead of taking the major roads. That said, Goa, where the drive was held, has a complicated network of roads which can confuse even Google Maps. The seats are fabric and come in beige colour. The front two seats now offer side bolsters but they do not give you a body-hugging feeling. Also, there is no armrest for the front passengers. Move to the rear and the increased wheelbase has now translated into more knee room. The rear passengers also get arm rest with two cup holders. 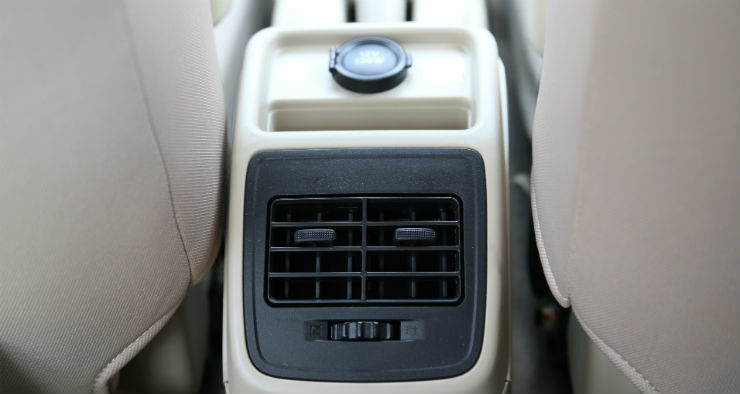 Maruti has also added a rear vent for AC, and the rear passengers also get a 12V charging socket. While the shoulder room has also increased, three adults were able to sit comfortably in the rear seat. Even though the height has come down by a bit, the headroom feels just right for the rear passengers. While it’s far from being class-leading, it’s not too bad. The new DZire also offers a lot of space on the doors for big 1-litre bottles and there is door pocket in the front doors. The rear passengers also get bottle holder on the doors. The boot space has increased by 60 litres and the car now offers 376 litres of boot space that is enough to take the weekend luggage of a family. Maruti has made the ABS and dual airbags standard across variants – that’s a big boost to safety. All the variants also get ISOFIX anchors for child seat, which is a first in the segment. The Heartect platform is also safer than the older platform. Maruti also claims that the DZire meets the upcoming regulations for BNVSAP (Bharat New Vehicle Safety Assessment program) that will come into effect from October 2017. Even though the ABS is standard across the variants, the brakes could have offered a better stopping power. Good enough to have one in your garage? Maruti, as always, has gotten the recipe right for the Indian market. The DZire was the best seller in the segment for a long time, and towers over competitors like Hyundai Xcent and the Ford Figo Aspire. With the new updates, the car is likely to become even more popular. Maruti has provided an extravagant update for the all-new DZire. Unlike the old DZire that looked boring, the new one grabs attention. The car now targets younger audience and has all the right features to do so. The pricing is attractive too, starting from Rs. 5.45 lakh for the base petrol variant and goes up to Rs. 9.45 lakh. With 14 variants, customers get a wide range of choices to select from. Now the only concern is how well can Maruti control the waiting period, which has already extended up to 8 weeks.